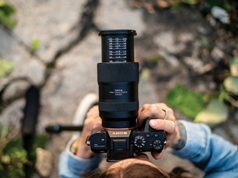 Judging from the lens introductions at photokina, and those already in the pipeline, consumers have some tough, though plentiful, choices to make when it comes to the glass they mount on their cameras. There are myriad choices to make when it comes to focal length, zoom range and speed. Of course, they are constrained by mount compatibility and budget. But even narrowing the field with those parameters doesn’t make the buyer’s decision easier. It’s muddled by more options in cameras and lenses than ever, and even more are coming. Consider the buyer who has an APS-C-format DSLR and a kit bag of lenses to boot. Let’s say this buyer is interested in getting into a lighter mirrorless model. As with many aspects of the consumer electronics marketplace, the consumer may feel compelled to upgrade to take advantage of the latest technology. The result is yet more hardware sitting unused in a closet. The old adage that you buy a camera for the next three years and lenses for life no longer applies. Of course, this change has to do with competition among camera makers. And also how the recent rush to mirrorless has affected all concerned. Technology being a key factor in competition means the latest manifestation can rapidly obsolete what was very recently current and popular. 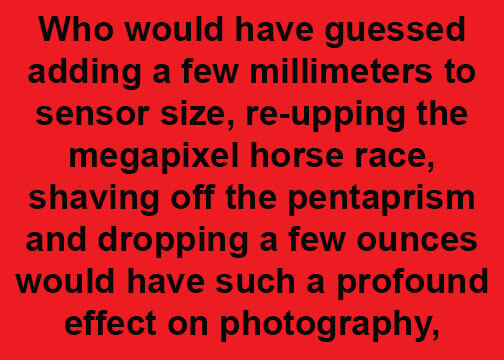 Who would have guessed adding a few millimeters to sensor size, re-upping the megapixel horse race, shaving off the pentaprism and dropping a few ounces would have such a profound effect on photography, and our industry? Well, it is what it is. Moreover, we are left with finding ways to aid buyers in making the right choice for their photographic needs and aspirations. Much of this goes back to “qualifying the customer.” The age-old sales method of Q&A made sure they got the right gear at a price they could afford. These days, however, it isn’t just a matter of asking what they like to photograph. Or how deep their pockets may be. It’s also being wise, and honest, about megapixels and RAW format and resolution and high ISO image quality depreciation. It’s about all the matters that go into image quality that the partnership between certain glass and cameras may or may not provide. Indeed, many customers arrive pre-qualified, with buying choices predetermined by their extensive, and increasingly required, Internet searches. Resources range from independent sites to paid placements and manufacturer web pages that help buyers match needs to wants. In addition, these sites proffer “buy now” buttons. They link either directly to the maker or affiliate links that kick back a few bucks to independent sites. As prices are fairly fixed, except on “clearance” items or bloated inventories, shopping around doesn’t offer much variance. So the competition in retail is built more around the quality and quantity of “information” as well as the sway of “influencers” and less around the sticker price. Speaking of influencers, this fall’s photokina highlighted the increasing importance of consumer shows. As covered in my October report in this journal, a well-run show in the right locale can draw thousands (and in the case of photokina, hundreds of thousands) of potential buyers. They come not only to handle gear but also to be inculcated into its charms by pros who do a talk and project, or live demo, on the show floor. Manufacturers recruit some of the top photographers in their fields, be they fashion, reportage, nature or travel. These pros do yeoman duty at live events and online. This is an aspirational play that is both effective in terms of sales and inspirational for those attending or watching. But there’s no question that online is where most of the education, and many of the closings, take place. DP Review, a site owned by Amazon, is one example of an enthusiast site that provides valuable info. When visitors click the Lenses tab, they find tabs for a Lens Search (“find the right lens based on spec [sic] and features); a Lens Compare (“select and compare lens specifications side by side”); and Lens Reviews (“check out our in-depth lens reviews and group tests”). It allows searches by brands going back to the year 2000! It’s an exhaustive list that includes 140 examples from Canon, 130 from Nikon and 90 from Sony, just three of the 20 brands listed. Checking in with a sampling of what’s offered by manufacturers also shows a major undertaking. On Canon’s site, which provides a “shop and learn” experience, visitors can look at lenses by “Interest” (portraits, sports/action, low light, landscape) or “Type” (telephoto, ultrawide, super telephoto, tilt/shift). In addition, they can get a full education on all tech matters concerning lenses, as well as info on sales and promotions. Nikon’s site has helpful “filters” for visitors to select lenses by price, usage, type and focal length. There’s also a self-guided/self-qualification route. Moreover, a very impressive Education area offers classes, videos and life-streaming events. Needless to say, Sony, Sigma, Tamron and other makers have similar extensive offerings. If you haven’t visited any of these sites recently, it is certainly worth a rainy day’s clicking. The camera and lens buyer has had to take a crash course in lens options and compatibility in the last few years. For example, the various sensor sizes made a hash of making lens choices by focal length, with the dreaded “crop factor” coming into play. Most folks regard focal length as a simple rule of thumb. 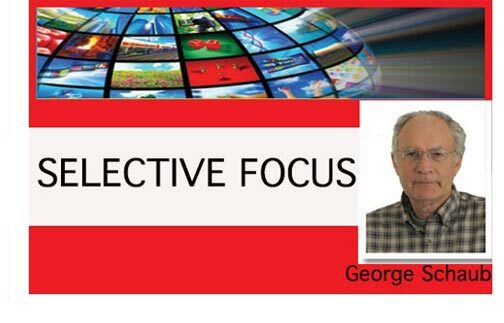 It tells them how wide the field of view is and in many instances how close they can focus on a subject. For those raised in the days of 35mm film, those effects were learned and hardwired; they knew what to expect from, say, a 150mm tele lens or a 24mm wide-angle lens. There is no question the crop factor caused confusion. More experienced photographers made an easier transition, knowing, for example, that an 80mm lens on a Hasselblad film camera captured the equivalent focal length of a 50mm lens on a 35mm camera. Moreover, to add to the fun, the crop factor was somewhat different on different brands. 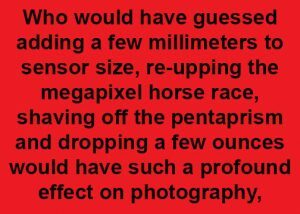 It was 1.5x on Nikons and 1.6x on Canons, making a 24mm lens “behave” like a 36mm (or slightly longer) lens, hardly what most considered a wide-angle optic. I have an old Canon G11, and the lens notation on the camera states it has a 6.1–30.5mm lens. Wow, that’s wide! But wait a sec: its equivalent is 28–140mm, a 4x crop. You might think all of this has sunk in. However, if you read the online forums about smaller sensor cameras, it seems that confusion among some (older perhaps) buyers remains. So while so-called full-frame cameras might seem a return to some sanity, it behooves us to be very clear about all of this when a buyer goes shopping, either online or over the counter. There will be new cameras, accessories and more arriving this coming year. In fact, we might be dubbing 2019 as the Year of the Lens. We’ve already seen lens roadmaps from Canon and Nikon regarding their R and Z models, respectively. As well as from Sigma and Sony and others. It’s an aggressive lens agenda covering many format and mount options. We’ll also see a host of adapters from different makers, both OEM and independents. These adapters will allow switching and swapping between various mounts and camera models, old and new. To add to the mix, the L-mount “alliance,” composed of Leica, Panasonic and Sigma, touts a standardized Leica bayonet type lens. It takes a page from MFT lens adaptability for using the same mount for numerous different brand camera bodies. The lens realm seems to be leading the way to new camera development, and all that follows. FYI, Leica developed the L mount in 2014 for their APS-C Leica T and then in 2015 for their full-frame Leica SL. It thus handles both formats. Panasonic announced two cameras, both full frame, that use the mount—the S1R and S1. In addition, Sigma indicated a new Foveon full-frame model is on the way. It also announced the availability of Sigma lenses with L-mount compatibility. These lenses will be compatible with both full-frame and APS-C-format models. As a result, the offerings will swell the ranks of an already crowded field. They may even spawn a new smaller sensor—and probably more affordable—camera push. These developments in camera bodies, formats and lens options make for a richer photographic environment. Choices are greater than any time in the past. With the ability of cameras—and also image-processing software—to read lens “profiles” and thus maximize performance, the promise is sharper, better contrast images with less aberrations, regardless of lighting conditions. Yes, higher resolving lenses help. However, even more affordable options are capable of delivering better image quality from digital cameras than ever before. Developments in camera technology are exciting. But for me the lens market is where the real action will be taking place.